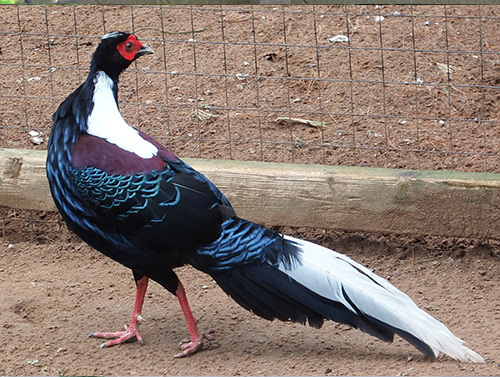 Description: Glossy black with a metallic blue sheen over the body feathers, the male Swinhoe’s pheasant is easy to identify. Red facial wattles and legs plus a distinct white crest, white back patch and white central tail feathers add contrast to the striking plumage. Female Swinhoe’s pheasants are slightly smaller, have smaller red facial wattles, red legs, and cream and brown mottled feathers with distinct bars on the wings and tail. 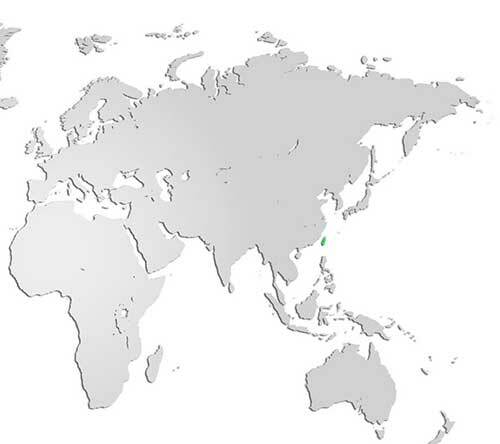 Distribution and Habitat: A protected species in its native habitat in the mountains of Taiwan, the Swinhoe’s pheasant is listed as Near Threatened on the IUCN Red List. Diet: Omnivores, Swinhoe’s pheasants forage for seeds and plants as well as insects and worms. Life Cycle: The female builds a nest in a safe, hidden place on the ground or in a tree, and incubates 3 to 8 eggs for 25 days, all by herself. The chicks will remain with their parents for the rest of the breeding season. Did you know? Like many other pheasants, the courtship displays of the male Swinhoe’s pheasant are elaborate with posturing and dance moves.